The Photog's Blog: Vice Versa and Black X....Wonder Twin Powers, ACTIVATE! 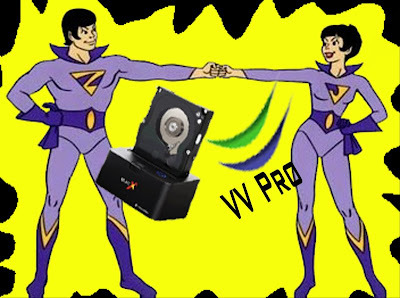 Vice Versa and Black X....Wonder Twin Powers, ACTIVATE! So what the hell am I babbling about? Vice Versa is a software that allows you to synchronize your files (among other things) between two different drives (source and target) via multiple levels of comparisons. (PC only at this point, but I am sure Macs must have something like this.) It has a lot of other features and capabilities, but I want to keep it clean here so I can show you how we utilize it and how I think it can best be used from a photographer's standpoint. This is where the Black X (by Thermaltake) comes in. 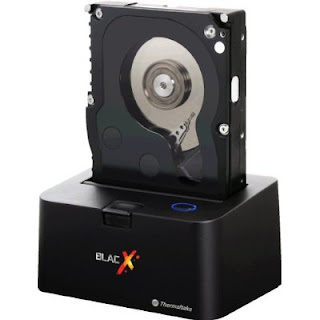 Essentially it is a hard drive docking station for internal hard drives(yes, PC and Mac compatible)that allows you to turn just about any 2.5" or 3.5" internal SATA hard drive (up to 2Tbs) into a plug and play USB Thumb drive! This makes buying Data storage nice and cheap! There are a couple of diffent models including this one (left) that has added USB ports. Currently we just have the standard version. Gail and I combine the abilities of these two great products together into a great back-up plan for protecting all our files and clients' images! So on my main workstation I have the Black X set-up. Using Vice Versa, I have it compare all the data on our Drobo (the "source" in Vice Versa terms) to a regular 3.5" internal hard drive (pre-formated, see below side notes) that is docked into the Black X (the "target"). In doing so, Vice Versa will then go through all the files and folders and compare and scan for any additions or file modifications/updates made since the last file syncronization. As far as deletions go, it will also give multiple options on how to handle them from completely deleting them to foldering them in a trash bin. Another real cool feature of Vice Versa is that you can set limits on how much band width you want it to eat up during this process (so as not to render your computer usless during these times) as well as the speed in which it is doing it. This will eliminate errors created by lag time differences in read/write speeds. Once you get these options set, you can use the scheduler to have this operation happen every night when you are sleeping. Take it one step further-you can have two drives (keep one offsite) and rotate them every day, once a week, once a month etc--whatever is best for your business. This way you always have an up to date back-up and an offsite fail-safe in the event of total disaster. And still go further-use the Black X and EZ Gig Software to protect yourself from a much more likely event--internal hard drive failure (UGH). (Which of course is only a pain in the neck and not a catastrophic event because you are storing your files on a Raided Drobo system...right?) Back to Black X... so, if you've created a drive image of the primary working station, that will have all your software loaded, settings, email, etc, then, in the event the system fails you install your complete system info as it was at the time the drive image was created) saving you hours of locating, reloading and updating programs to get you back in the action! So cool. 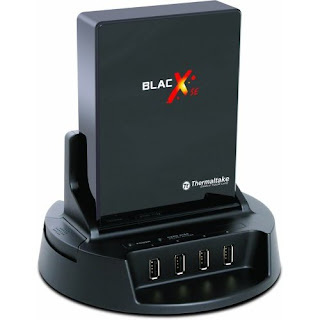 The Black X is both USB 2.0 and eSATA capable. (I have not worked with the eSATA connections yet, but they claim 3Gbs per second which is like 6 or 7 times faster then USB 2.0.) Whenever you buy a new internal hard drive, you will have to format the new blank hard drive before you start using it. It's easy and once you do it once you will be all set. Read about it here. It can take a while so don't plan on using the drive right away. You're best off running this the night before you plan to put it into action.